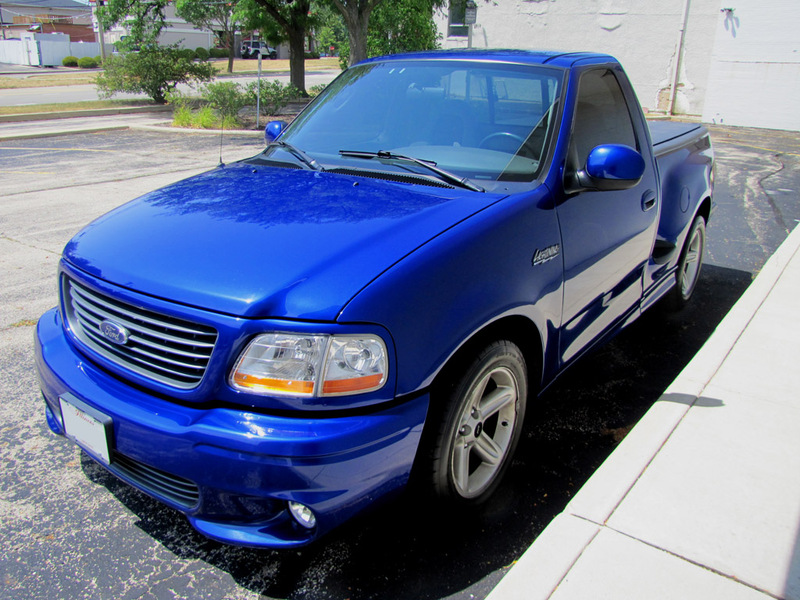 In late 92' is when the first SVT vehicles were first showcased: The 93' Mustang Cobra, and the 93' F150 Lightning. The 93 Cobras were only available in hatchback, and in black, red and teal. They started with a base GT model, changed some of the body work, added rear disc brakes, stiffer suspension, different wheels, and a little more power. The 93 Cobras are underated at 235 HP w/ the addition of GT40 iron heads, factory 1.7:1 roller rockers made by Crane Cams, Cobra intake, improved MAF system and higher flowing injectors. The only reason I say underated is becuase adding GT40 iron heads/rockers and Cobra induction to a standard 5.0 HO Mustangs generally results in the area of 240 HP to the wheels. 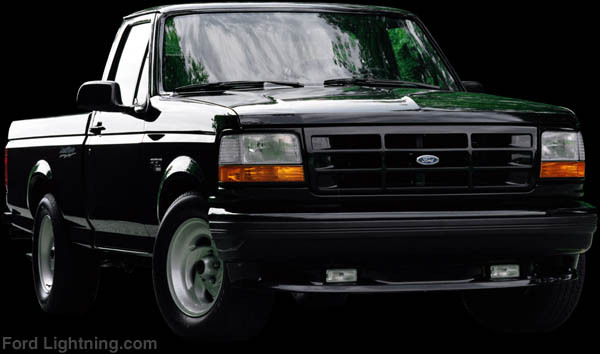 The 93-95 Lightnings were essentially short-bed, regular cab, 2WD F150's with more power and a lower stance. 1st gen Lightnings are powered by a modified roller cam 351W (5.8L) w/ similar GT40 iron heads, a unique GT40 intake manifold. The E4OD trans was modified, came with an aluminum driveshaft and 4.10 gears standard. Suspension lowered 1 in. in front and 2.5 in. out back. The interior had bucket seats, and the exterior had its own unique body work. 93'-95' Lightings were rated at 240 HP, and 340 ft/lbs. torque. 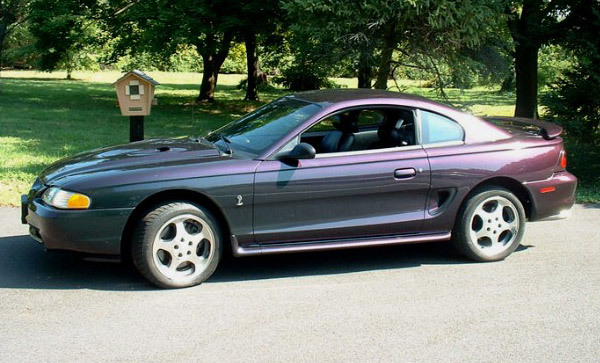 Released late in 93' were limited runs of the Mustang Cobra R; only 107 were produced. This Mustang was a race-ready version intended for track use, but also street legal. The powertrain is the same as the standard Cobra, and the exterior is the same for the most part, and thats where the similarities end. The interior is reduced to the bare essentials; the rear seat and seat belts are removed, the A/C system is removed, the radio/entertainment system deleted, and all sound-deadening materials are also removed. The suspension consists of even stiffer springs, factory Koni struts/shocks, stiffer roll bars, and some chassis bracing. The brakes are upgraded to 13 in. front rotors w/ PBR calipers and the rears at 10.5 in. rotors. The wheels are 5-lug (all previous fox-bodies except for the SVO are 4-lug), and are actually factory wheels for the then un-released 94' GT, just painted black. 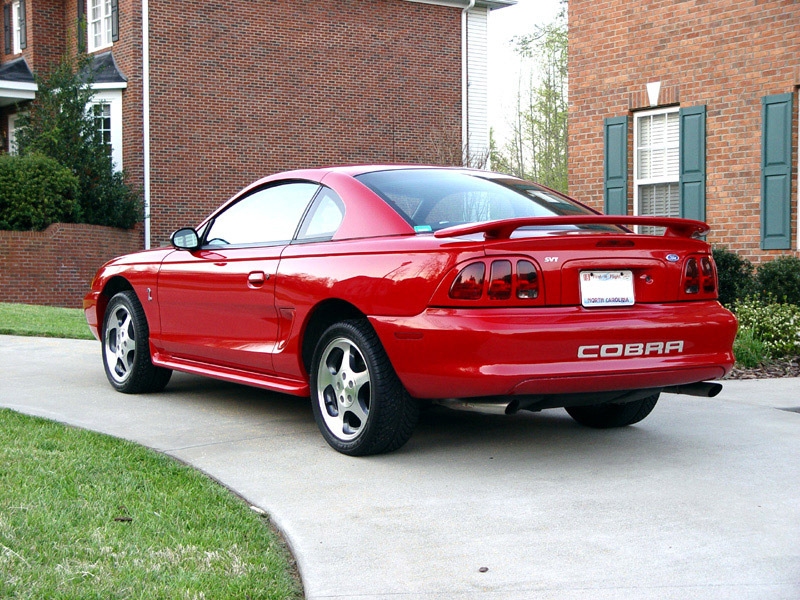 In 1994, the Mustang was redesigned and SVT applied their treatment to the new Cobra. The Lighting was a carry-over model from 93'. The 94' Cobras had nearly indentical powertrain/drivetrain to the 93's. The suspension had improved geometry over the 93' and older Mustangs, and the big brakes available on the 93 Cobra R's, became standard on the 94' Cobras. Unique body work and premium interior items were standard on the Cobras such as leather seats and the premium Mach 460 sound system. The 94/95 Cobras are rated at 240 HP. Also in 94' Ford produced 1000 Cobra Convertable Pace Car replicas. 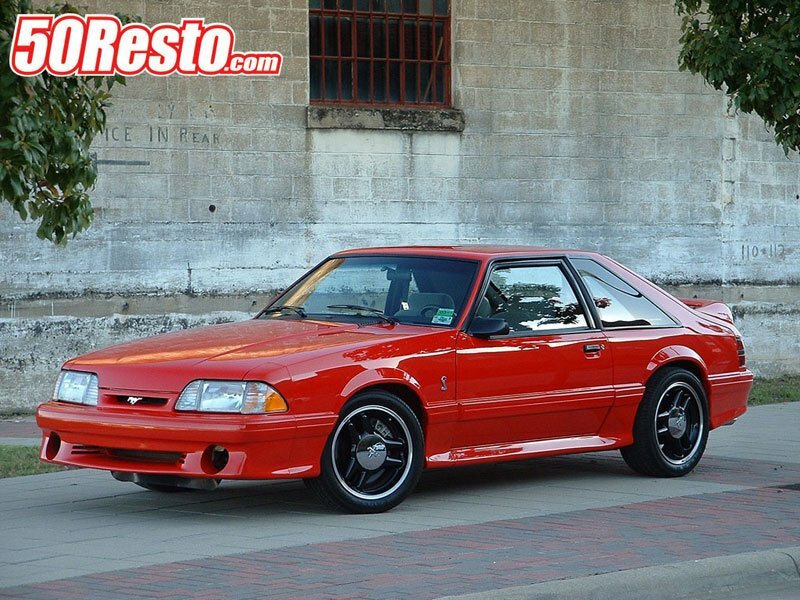 1995 was a big deal in the Mustang world; the Mustang Cobra and F150 Lighting were again carried over from the previous years nearly unchanged, but another Mustang Cobra R was produced. The 95 Cobra R is the only late model Mustang that came factory with a 351W. This version of the Cobra R had the same ideas in mind that SVT had with the 93, only more improved. Powered be a 300 HP/365 ft/lbs. torque 351W, a standard Tremec 3550 transmission, gutted interior, unique Cobra R wheels, and a 20 gallen fuel cell, this Cobra R could only be had with a competition racing license. Only 250 versions of this Cobra R were available. 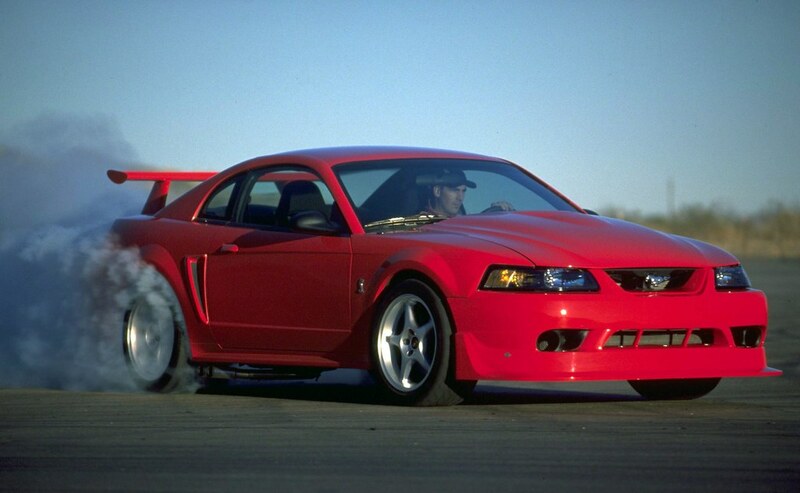 1996 Had many Mustang fans worried, as the old pushrod 5.0L was now replaced by the new 4.6L OHC engines. The GT's with their SOHC version were actually slower this year than the previous models 5.0L, but this was not so with the new DOHC version the Cobra got. "Mystic" Cobras become available this year only and the Lightning model is dropped from the line-up. 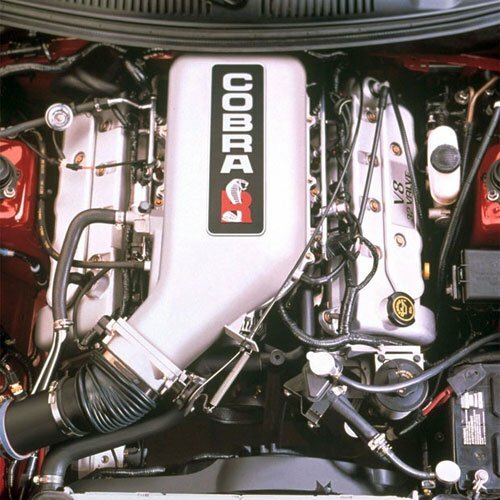 The 96-98 Cobras came standard with an all-aluminum DOHC 4.6L. This engine was able to rev out to 6800+ RPM's and make 305 HP and 300 ft/lbs. of torque. The rest of the Cobra had only minor cosmetic changes over the 94/95 models. The suspension, brakes and interior are nearly the same. 96' Mystic Cobras had color changing paint by BASF. Green based paint that changed to purple, amber, and brown depending on the angle it was viewed at. 1997 Was virtually a carry over year. Cobras remain nearly unchaged and no other SVT models are added to the line-up. The Super Stallion concept was showcased this year. The 97' Super Stallion was created by SVT to show some of the technology they were working on that would end up on future Mustangs. The Super Stallion is powered by a supercharged 5.4L that runs on both gasoline and E85. On gas it makes 545 HP, but on E85, it makes 590. Aside from power, it has a T56, SLA style front suspension, IRS out back and custom interior and exterior work. 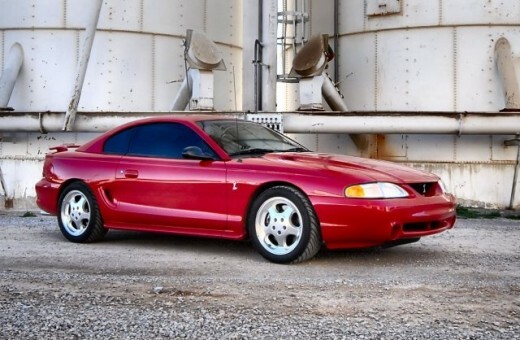 In 98' the Cobra saw minor changes, one of which being new wheels that were similar to the 95 Cobra R wheels. SVT introduces its version of the Contour. The SVT Contour was produced and given the same treatment as other SVT models. This one powered by a 2.5L V6 making 195 HP along, with suspenison changes, unique body work, and Cobra style wheels. All SVT Contours are only available in manual trans. 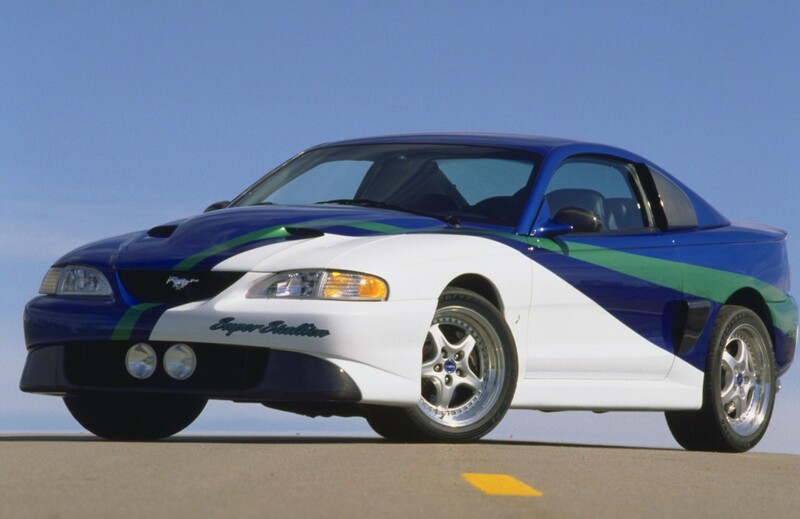 In 1999, the Mustang gets re-bodied under the same "SN-95" chassis, SVT bumps power on the Cobra, offers IRS, but suffers in delevering on power ratings. The Lighting is re-introduced with more power via a supercharged 5.4L. The 99' Cobras get a bump in horsepower and torque to 320 HP and 317 ft/lbs. through new "tumble port" heads and redesigned intake manifold. For the first time in Mustang's history, an IRS is standard on the Cobra. Despite the good news, a large majority of 99' Cobras were down on power, in many cases making less power than the current GT models. Ford released "the fix" which included a reprogramed PCM, revised intake manifold, and a new exhaust system to bring the power back up to the 320 rating. The Lightning returned on the redesigned F150, this time with a Supercharged 5.4L making 360 HP and 440 ft/lbs. of toque. This engine comes with forged pistons, rods and crankshaft, along with a 4R100 transmission and 9.75 rear axle borrowed from the Superduty. It also comes standard with a lowered suspension and Bilstein shocks. The Contour is carried over, with only minor changes; a 5 HP bump to 200, and more Cobra style wheels. The 2000 model year saw a halt to production of the SVT Cobra, as Ford attempted to take care of all the 99' models that suffered power loss. The Lightning and SVT Contour are carried over. Ford produces the final Cobra R.
The 2000 version of the Cobra R is the baddest of the three. It produces an underated 385 HP and 385 ft/lbs. of torque with a naturally aspirated DOHC 5.4L. It has unique cylinder heads, intake manifold, and Borla exhaust. In true R status, the interior is stripped; no A/C or radio, but this version comes with factory Recaro seats. The IRS has beefier half-shafts, a Gerodisc hydro-mechanical differential and 3.55 gears. A T56 6-speed is standard as well as a B&M Ripper shifter, the suspension comes equipped with Eibach springs and Bilstein struts/shocks. Functional and removable wing and front splitter are added for stability. The fastest of all 3 R models and only 300 were produced. 2001 Saw the return of the Cobra with an honest power rating. Lightning gets a bump in power. SVT Contour is dropped from the lineup. The 01' Cobras return with a full 320 HP and are up to the task being one of the fastest standard Cobras at its time. Offering 0-60 times in the 4.8 sec range and quarter mile times in the mid 13's off the showroom floor. 01' Lightnings get a bump in power to 380 HP and 450 ft/lbs. of torque. The wheels are re-designed, and some cosmetic features are updated. No SVT Mustangs are available in 2002. Lightnings carry over and Ford introduces the SVT Focus. The SVT Focus has a modified 2.0L Zetec engine from the standard Focus, this one producing 170 HP through variable valve timing, a slight bump in compression, and a higher flowing exhaust. The transmission is a Getrag 6 speed, and the suspension has been upgraded to stiffer springs and shocks. The brakes are also increased in size in the front with discs standard in the rear. It also rides on unique SVT wheels and wider tires. In 2003, the SVT Cobra returns with supercharged power. The Lightning carries over, and the SVT Focus becomes available in a 5 door version. The 03/04 Cobras, also know as Terminator Cobras, come with a Supercharged version of the DOHC 4.6L. They come factory with forged pistons, Manley rods, and froged cranks in an iron block. The engine is backed with a T56 6-speed, and sent to a beefed up IRS. The suspension has revised tuning with Bilstein struts and shocks. The wheels and tires are wider; 17x9 wheels with 275/40 tires. These Cobras also have unique body work. This version produces a conservative 390 HP and 390 ft/lbs. of torque. Also produced in 2003 were limited edition 10th Anniversary Cobras to celebrate 10 years of SVT. 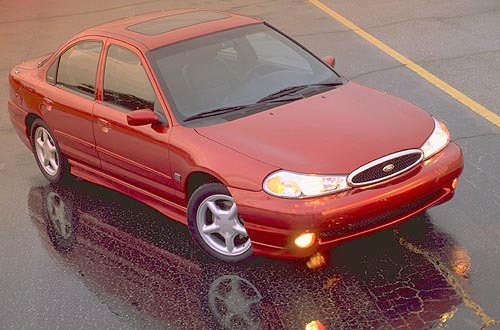 2004 Would be the last year for all three SVT models; the Cobra, the Lightning, and the Focus. 2004 Cobras were carry overs from 2003, but were available in Mystichrome. Similar to the 96' Mystic Cobras, this paint was slightly blue, changing to to shades of green, purple, and sometimes black. In addition to the exterior, the seat inserts and steering wheel also had the same shimmering color. No SVT models were offered in 2005 and 2006. While not directly responsible, SVT did have a hand in development and assembly of the Ford GT. The cylinder heads that were developed by SVT for the 2000 Cobra R made their way to the supercharged engine of the Supercar in a slightly modified version. Interior and manual trans assembly were also handled by SVT.